L-R: Howes Percival's Oliver Brookshaw, Geraint Davies, Daniel Banton, Jahid Ali and Haydon Simmonds. Regional law firm, Howes Percival, has expanded its Leicester office with three senior hires from Spearing Waite LLP. 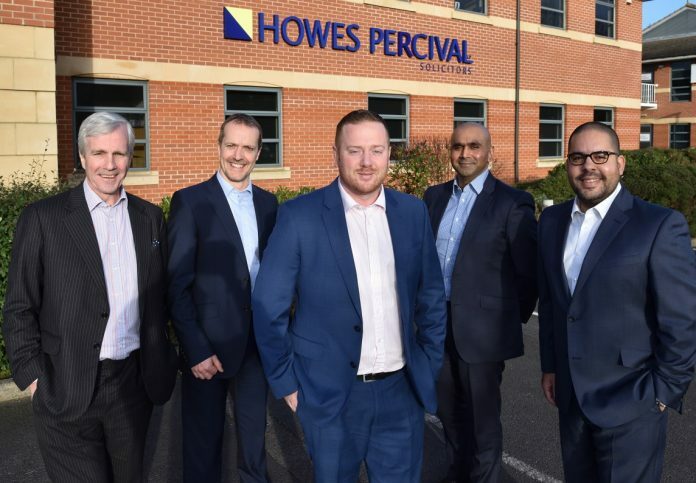 Commenting on the appointments, Geraint Davies, Partner and Head of the Leicester office at Howes Percival said: “I am absolutely thrilled to welcome Jahid, Oliver and Haydon – three well respected and experienced senior experts – to Howes Percival. This is a significant coup for the firm and sends a very strong message that Howes Percival is committed to the Leicestershire market. The move forms part of our strategic aim to be the go-to law firm in Leicester for each of the key markets in which we operate and to grow our presence in the East Midlands legal market.